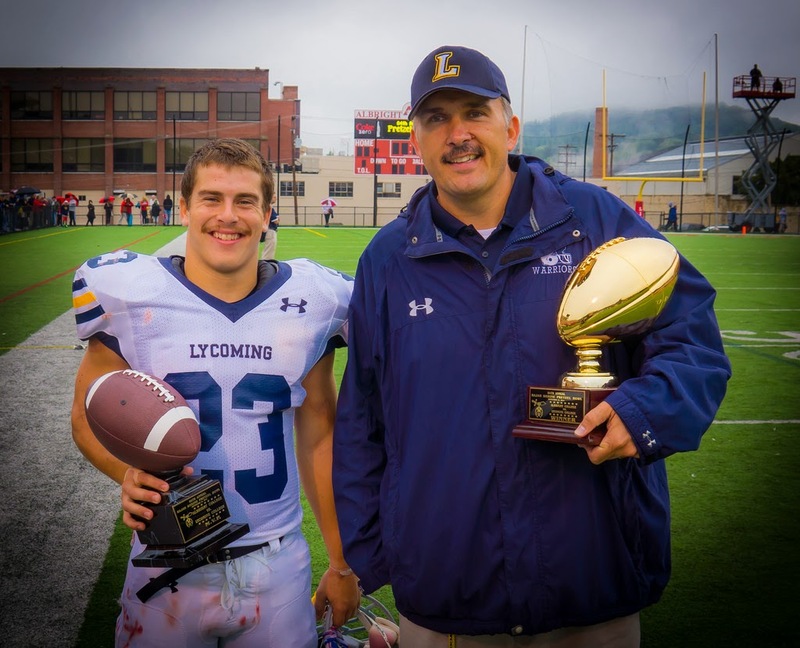 Sr. RB Craig Needhammer and Head Coach Mike Clark receive the Pretzel Bowl trophy after the Albright game. 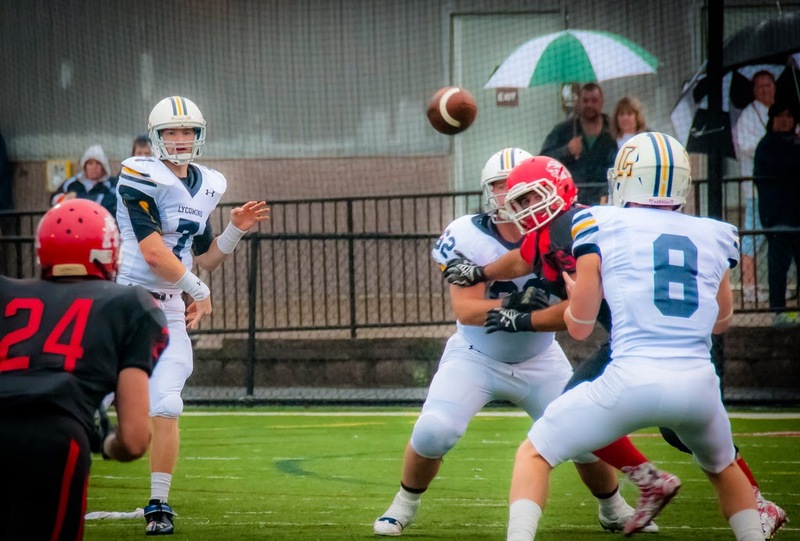 READING, Pa. – With one more patented standout defensive performance, the 23rd-ranked Lycoming College football team opened the 2014 Middle Atlantic Conference season with a dominating 26-0 win over Albright College in a rainy Pretzel Bowl at Shirk Stadium on Saturday, Sept. 13. The offense was efficient once again, with senior Craig Needhammer (Lansdale, Pa./North Penn) finished with 112 yards on 29 carries and his 30th career rushing touchdown, breaking the school record of 29 set by Tim Deasey (1998-01). Senior Tyler Jenny (Glasgow, Pa./Glendale) was just as good out of the quarterback slot, finishing 16-of-23 for 199 yards and two touchdowns. 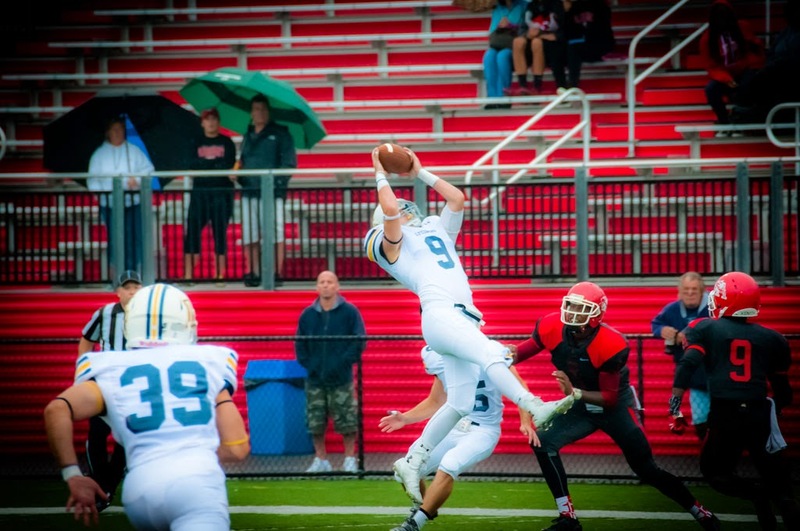 Junior Ryan Umpleby (Forest Hill, Md./Fallston) finished with five catches for 87 yards and a score and senior John Sibel (Yardley, Pa./Pennsbury) caught six passes for 62 yards and a score. “We were sloppy at times and had too many penalties and we should have scored a couple more touchdowns offensively, if not for a couple penalties and dropped passes,” Clark said. Defensively, junior Mike Gentile (Havertown, Pa./Haverford) had a breakthrough game, posting two interceptions and adding four tackles. The team forced three turnovers and allowed Albright just seven first downs and 118 total yards. “We played with a lot of energy, defensively, and did a great job shutting down anything that they were trying to do,” Clark said. The Warriors started the game by forcing Albright into a quick three-and-out before getting the ball at their own 23-yard line. Needhammer started the game with a 17-yard run, helping the Warriors go on a 11-play, 70-yard drive, which also featured a 36-yard hookup between Jenny and Umpleby that led to a 17-yard field goal by freshman Devon Flynn (Levittown, Pa./Conwell-Egan Catholic). In the second quarter, the Warriors struck again, with Jenny finding Umpleby for 24 yards and a score with 13:40 left to cap an eight-play, 42-yard drive. Lycoming continued to cause problems for the Albright offense, forcing two three-and-outs before Needhammer posted two 35-yard gains, one on a pass and the next on a rushing touchdown with 2:23 left, sending the Warriors to the locker room with a 16-0 lead. Both teams struggled to move the ball through the rain in the third quarter, but Lycoming was able to start an 11-play, 80-yard drive to end the quarter, with Jenny finding Sibel in the corner for a 19-yard touchdown pass with 12:57 left. Flynn rounded out the scoring later in the half, connecting on a 36-yard field goal with 2:27 left. Junior Matt Malecki (Stevensville, Md./Kent Island) led the Warriors with eight tackles and 1.5 for loss and senior Tanner Troutman (Hegins, Pa./Tri-Valley) added five stops. Junior Josh Cook (Hatfield, Pa./North Penn) and junior Cole Welham (Lewistown, Pa./Lewistown Area) each added sacks and Welham led the team with two tackles for loss. Junior John Ciurlino (Springfield, Pa./Springfield) also recovered a fumble. Ryan Wade finished 3-of-10 passing for 26 yards and an interception for the Lions and Trey Faust notched 11 carries for 53 yards. Malik Gilmore caught three passes for 25 yards. Albright’s defense posted 13 tackles for loss in the rainy weather, led by two sacks from Jamel Hayden and 10 tackles and two tackles for loss from Steve Barroso. Junior Colton Ryan added eight stops and three tackles for loss. The Warriors get back on the court on Saturday, Sept. 20, when they host King’s (Pa.) in a Family Weekend matchup at 1:30 p.m. at David Person Field. The Warriors will be looking for revenge on King’s after a 28-24 defeat in Wilkes-Barre in 2013.